A paper by Booth et al 2012 has attracted a lot of attention because of the claim it makes that the interdecadal variability in the North Atlantic is in large part the response to external forcing agents, aerosols in particular, rather than internal variability. This has implications for estimates of (transient) climate sensitivity but it also has very direct implications for our understanding of important climate variations such as the recent upward trend in Atlantic hurricane activity (linked to the recent rapid increase in N.Atlantic sea surface temperatures) and drought in the Sahel in the 1970’s (linked to the cool N. Atlantic in that decade). I am a co-author of a recent paper by Rong Zhang and others (Zhang et al 2013) in which we argue that the Booth et al paper and the model on which it is based do not make a compelling case for this claim. The interest results from the figure in the left panel above. This model’s forced response agrees very well with the observed surface temperatures averaged over the North Atlantic, so in this model one doesn’t need to invoke internal multidecadal variability to match these observations. (The forced response is estimated by averaging over multiple realizations of the model with different initial conditions). Zhang et al list several aspects of this simulation that seem problematic, exemplified by the upper right panel, which shows a time series of the ocean heat content down to 700m over this same region. (observations from Levitus, 2009). The model does not produce the upward trend in this N. Atlantic heat content. If one removes the anthropogenic aerosol forcing from the model (green line) it fits these observations better. Another problematic aspect of the N.Atlantic simulation is the co-variability of temperature and salinity. Decadal scale temperature and salinity variations in the subpolar Atlantic tend to be positively correlated in observations. In particular, the cold period in the 70’s was marked by a fresh subpolar Atlantic. This is what one expects when the AMOC is weak, with less transport of more saline waters from the subtropics and more export of fresh waters from the Arctic. The model does not show this correlation, and in the 70’s it has relatively high salinity (presumably due to the stronger AMOC mentioned in the previous paragraph). Our understanding of AMOC variability is admittedly limited, but the temperature-salinity correlations point towards there being a substantial internal component to the observations. These Atlantic temperature variations affect the evolution of Northern hemisphere and even global means (e.g., Zhang et al 2007). So there is danger in overfitting the latter with the forced signal only. Our lab has a model, CM3 (Donner et al, 2011), that also has strong indirect aerosol effects and that produces simulations of the past century that share many of the features of HAD-GEM2-ES discussed here, including the nice fit to the N. Atlantic SSTs. So this issue is naturally a hot topic of conversation in our lab. The issue has been around for a while. For example, Rotstayn and Lohmann 2002 made a case that strong aerosol forcing could explain the Sahel drought of the 70’s by cooling the N. Atlantic. The same qualitative behavior is seen in many models, but we are left with the quantitative question of how big the aerosol effect is. Differences of opinion make life interesting and always force us to sharpen our arguments. And there remain strong differences of opinion on the relative importance of AMOC variability and aerosol forcing for the non-monotonic variation of North Atlantic surface temperatures and all the phenomena that we think are affected by it (including hurricanes and African rainfall). But I remain skeptical that one can make a compelling case for aerosol dominance by focusing only on SSTs, without simultaneously considering salinities and sub-surface temperatures that are better able to distinguish between forced and free variations. This would suggest that the AMO may be a strong candidate to explain Bond events. If this is the case it is almost certainly a natural mode of variability. The overturning circulation in the Atlantic is an intuitively plausible candidate for being involved in any climate variations showing anti-correlation between the poles. A key distinction here is that the ‘abrupt climate changes’ which punctuated the last (and likely even prior) deglaciations were not internally forced, but involved an external trigger (freshwater pulses) to change AMOC. Just attempting to pick apart the different components contributing towards the modelled effects, are the strong aerosol impacts in HadGEM2-ES and the AMOC/salinity dynamics necessarly dependent? I guess what I’m asking is whether it would be at all problematic to have a model with the same aerosol effects but different AMOC dynamics reproduce the observed SST and ocean heat content variability? I suspect that it will be difficult to fit surface temperature, salinity, and heat content constraints in the N. Atlantic with the forced response being dominant, as long as the response to cooling is a strengthening of the AMOC. But I have a tendency to oversimplify (ie, the idea that Atlantic variability on this time scale can be characterized by a single AMOC index is simplistic, subpolar and subtropical responses could be dominated by different dynamics,etc). So we may have to wait and see. Regarding Saharan dust, this is certainly a player in the subtropical N. Atlantic. and variations in dust are plausibly a significant part of the response to AMOC variability, whether forced or free. In a lot of models, low frequency free variations in the N Atlantic are very subpolar focused, with little subtropical signal (and this is sometimes used as evidence of the need for a forced component), so Saharan dust response could be a missing element in these models, helping to make the structure of internal variability more realistic. It could equally well affect the response to anthropogenic aerosol. But I don’t see how it would help in making a consistent picture between SST, salinity, and heat content if the anthropogenic component is dominant. On the Saharan dust I was really speculating that the strong aerosol influence over the Tropical North Atlantic in the HadGEM2-ES runs might not be predominantly anthropogenic. Having done some digging it does appear that the modelled dust load over this region (and other regions) is enhanced in response to cooling from large volcanic eruptions, which means a strong dust cooling influence from the 1960s which only really disperses around the late-90s. There is also a fairly large increase in modelled sulfate load over the Tropical North Atlantic from about 1960, which is presumably the main cause of modelled present day strong aerosol forcing off the West African coast, as depicted in Booth et al. figure 4b. I thought this might also be partly natural (influence of dust on DMS emissions, perhaps) because local SO2 emissions are comparatively small. However it seems to be the case that modelled aerosol deposition processes in the Tropical North Atlantic are much slower than, say, the Extratropical North Atlantic, by about a factor of 5, which means small SO2 emissions increases can make large cumulative changes to the sulfate load in this region. Booth et al state explicitly that the anthropogenic aerosol component is of major importance in their simulation of North Atlantic SSTs, based on model runs with and without the anthropogenic component. Given emissions, the sulfate concentration in the troposphere equilibrates in a matter of weeks at most. The troposphere does not accumulate aerosols over a time scale of years. The idea that volcanoes could affect Atlantic SSTs by affecting the Saharan dust source strikes me as implausible and certainly smaller than the direct effect of the volcanic aerosol on temperatures. I wasn’t very clear concerning the sulfate loads: There is a notable increase in sulfate over the Extratropical North Atlantic from about 1960 to 1975, which makes sense because of the large increase in North American SO2 emissions at the time. The surprise for me came from observing a similarly-timed sulfate load increase of comparable size over the Tropical North Atlantic despite local SO2 emissions being an order of magnitude smaller than those from North America. It seems that differing modelled deposition rates between the Tropical and ExtraTropical Atlantic can explain this apparent oddity. In both cases, by my crude calculations comparing sulfate load with deposition rate, I’m still talking about a matter of days to weeks for equilibration – about 6 days in ExTrop and 30 in Trop. The volcano-cooling-dust-cooling feedback loop may be implausible, and I think a couple of papers have noted that HadGEM2-ES tends to be a bit hyperactive with regards dust (e.g. Bellouin et al. 2011). However, it is there in the model: see this comparison of dust load and TOA upwelling shortwave in the Tropical N. Atlantic. The dust load increases in response to volcanic cooling, and seems to be a major factor in the regional shortwave flux. I think another way to appreciate this influence is to look at the difference between regional upwelling shortwave in HadGEM2-ES and HadGEM2-AO, which is functionally the same model, with the same anthropogenic inputs except without biogeochemical feedbacks. I’ve included plots for the less dust-affected Extratropical N. Atlantic region in each to provide some context. Thanks for the clarification. With regard to the aerosol loading in the tropical N. Atlantic, the sources needn’t be local — European aerosols can be carried around the subtropical anticyclone and enter the Atlantic at low latitudes in some fraction of meteorological conditions. I assume that this is what is happening in the model. Aerosol-cloud interactions can also create geographical structure in the forcing not present in the aerosol loading itself — ie weakly forced fair-weather subtropical cloud can be more sensitive to aerosols than cloud in strong midlatitude systems. As for the volcano-Saharan dust connection — thanks for the links. I’ll have to look into this. I think it is a non-contraversial issue that one should expect an equator-/polewards shift (plus expansion) of the Hadley cell in response to any forced cooling/warming. So nothing new here I guess. It goes without saying that the NAO exerts a similar response (cooler/warmer Atlantic leads to more/less dust) which I would consider the component of natural variability if you like. The corresponding drying/wetting of the Sahel (change in northward monsoon extension) eventually leads to substantially more/less Saharan dust emissions. Volcanoes should do the job as well, but I’d reckon that the signal is harder to find given the high interannual variability in Saharan dust emissions. But, the short duration of the volcanic forcing pulse makes an Atlantic SST impact unlikely (IMHO). In contrast, sustained SO2 aerosol forcing has very likely an effect. HadGEM2-ES got some trouble to get the dust feedback right as it fails to balance the bare soil extent in semi-arid regions properly. Bare soil extent seems to be biased high from the start which makes it less susceptible to further drying. While the model actually captures the drying, the dust feedback is missing (see supplementary material from Booth et al.2012). Hence, regardless of the model scenario, the dust emissions remained fairly constant. I think Isaac got it right that the bulk of the tropical N.Atlantic aerosols in the model isn’t of local origin but advected. In fact, it is highly unlikely that it is dust induced DMS emission as there is barely an increase in simulated dust emissions after all. Given that the HadGEM2 aerosol forcing is running a bit high (I spoke with Nicolas Bellouin about this issue last year), I wonder whether a minimally decreased SO2 forcing could potentially solve the problem in the simulated spatio-temporal OHC pattern? Otherwise, it would be interesting to know how the aerosol effect would play out if the model had a more variable NAO. I spontaneously think of some nudging experiments to push the model more towards the observed state (with regard to the circulation or NAO phase). Mimicking the great salinity anomaly would be another (additional) option. Would you think that any of these measures could have the potential to bring model results and observations in better agreement? If I had to make a bet, I’d say that the better agreement in OHC between the constant forcing run and observations in the current version of HadGEM2 is likely to be right for the wrong reason. No doubt however, that the 80 percent figure for external forcing impact is a bit over the top. P.S. @Paul: Thanks for hinting to the temporal mismatch between (smoothed) CONUS emissions and the Smith et al. 2011 data. Haven’t exactly noticed that before. I wonder whether the models would reproduce the US dust bowl a bit better given the reduction in SO2 emissions following the great depression. Having said that, the peak in US-SO2 emissions and the rather simultaneous peak in global temperatures (exactly) during WWII never ceases to puzzle me. I have to say I was somewhat confused by the discussion of dust in both the paper and SI when I tried to relate it to the various model output datasets I had downloaded and was viewing. I even considered they might be looking at a different set of model runs, so I checked the ensemble SST time series and it was an exact match for the one shown in the paper. I don’t have a good intuition for what would be considered large dust variability, but don’t see how surface dust concentration (I think that’s what it must be) in Barbados could be a reasonable proxy for the total atmospheric dust variability over the Tropical N. Atlantic. The rationale for presenting modelled dust variability in this way isn’t clear when it’s straightforward to plot the modelled dust load over a larger region as I’ve done in the graph linked in the post above. That plot clearly shows the dust load varying, with maxima corresponding to periods of volcanic activity and minima corresponding to volcanic inactivity. I guess it’s possible that this isn’t directly related to a dust emission feedback, but perhaps a feedback which is affecting the deposition rate of dust. Either way there does seem to be significant low frequency atmospheric dust load variability in these model runs. Regarding the effects of this dust variability, it’s possible the strong correlation between Tropical N. Atlantic (TNA) dust load and TNA upwelling shortwave indicates a tightly-coupled dust feedback/dust-deposition feedback response, with the dust itself being mostly benign, rather than dust dominating upwelling SW flux. However, if that’s the case it leaves me puzzled about why the HadGEM2-AO TOA upwelling SW time series for TNA has such a different shape from HadGEM2-ES, considering the AO version uses the same anthropogenic and volcanic forcing inputs and has the same atmosphere-ocean dynamics. Is there some other biogeochemical feedback which could be driving this? Regarding the TNA sulfate load, I had considered the possibility of influence from non-local sources but the shape of the curve doesn’t fit that scenario very well – there is a gradual, linear incline up to 1960, then a rapid increase. If there were significant influences from remote regions I would expect more earlier variability. Modelling the local SO2 sources with a relatively low deposition rate would appear to give a decent fit. It probably is the case that the size of the local sulfate load doesn’t translate linearly to local total forcing, though it’s worth noting that is essentially an assumption built into Booth et al.’s attribution. Perhaps oddly, I think CMIP3 models used annually-resolved historical SO2 emissions. The HadGEM1 CMIP3 run shows noticeable spikes in NASSTs in the 1930s and 1950s, which correspond well with those large SO2 emission downturns in Smith et al., and similarly-timed spikes in the real NASST datasets. Not sure what the rationale was for using decadally-resolved emissions data in CMIP5? I hadn’t checked the individual members and the local response. I should have paid much more attention to the dust loading image you’ve shown in the previous post. It makes my previous comment look a bit nonsensical in some way. In fact, the way I thought the bare soil problem acts to inhibit dust emissions works just the other way around. Now I got what you meant when you were referring to “hyperactive with regard to dust”. Plus, I see why you are confused by their discussion of dust. Thanks for following up this matter. Highly appreciated! Judging by the dust loading in HadGEM2-ES over the TNA, the variability seems fairly high indeed. Doesn’t exactly match the simulated Barbados concentrations (Fig.S6b in SI), though this is what you’d definitely expect to see (as far as my intuition as a dust modeller doesn’t lead me astray). Very strange! Guess I’ve gotta ask Nicolas what is going on here. Perhaps problems with the deposition rate. Good catch Paul. I should have noticed that before. The rational to compare with the Barbados dust is, that it is (1) the longest dust record we’ve got, and (2) that it is indeed considered a very good proxy for the Sahel/Saharan emissions and thus the global dust budget of which the bulk stems from Northern Africa and Middle East. Guess that’s due to continuous dry deposition all the way over the Atlantic. Hence, a dust-link to the TOA upwelling radiation appears much more likely than previously thought on my part. I totally agree with you. Only the timing is an issue (with regard to Barbados observations). The response to volcanoes in the model seems way over the top. 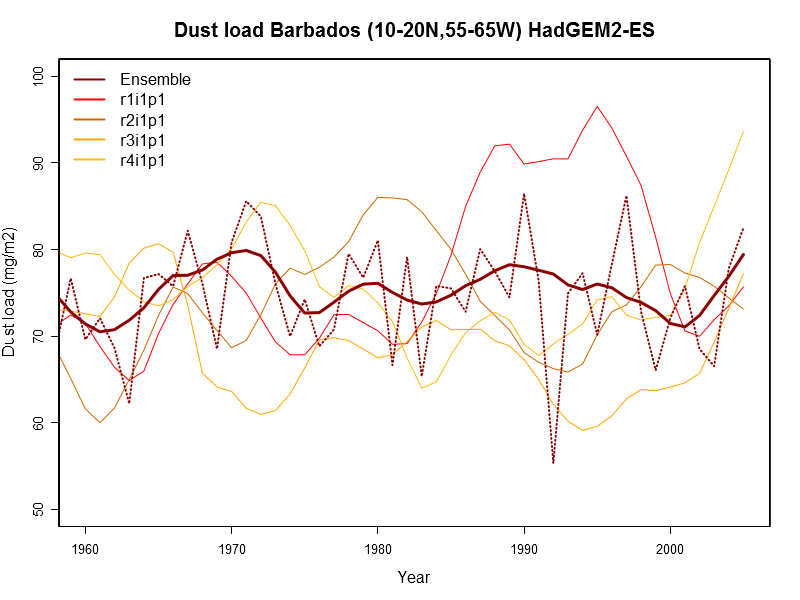 The Pinatubo doesn’t show up in the Barbados record at all, indicative of no effect whatsoever upon dust emissions. Not too surprising, given that it occurred amidst the strongest positive NAO period observed. I wonder what the NAO strength is in the model (haven’t checked). It doesn’t need to be tied to the SSTs. As far as HadGEM2-AO is concerned, there are three important issues which might explain the discrepancies. (1) The missing tropospheric chemistry affects the conversion rate from SO2 emissions to sulfate aerosols (hence the indirect effect is inevitably affected). (2) The missing ocean biogeochemistry prevents DMS aerosols to be produced interactively. AO uses a DMS climatology instead. (3) The problem with the bare soil fraction leads to excess dust emissions in the ES version (as just discussed), while the AO version tends to underestimate the dust. In any case, the resulting AOD discrepancy is quite large (see Martin et al. 2011). All three points together may explain the apparent mismatch between HadGEM2-ES and AO. Regarding TNA sulfates, which local SO2 source region are you referring to? Central Africa? Intuitively, I would assume that the dust related DMS fraction is a significant contributor to the total sulfate fraction (apart from the advected fraction from remote sources as Isaac has suggested). The low deposition rate for the local sources (reduced wet deposition I guess) is a fair point however. just a quick update re HadGEM2-ES. I compared the dust load of the individual members and the ensemble of all 4 runs. In this plot, r1i1p1 vs ensemble is shown for the TNA region and the Barbados region. As expected, they agree very well. What doesn’t agree, however, are the individual ensemble runs (only initial conditions are changed). I plotted all members vs ensemble for the time period past 1960 for Barbados (individual members are smoothed), and it turns out that there is in fact no robust model dust response to external forcing. The ensemble result corresponds with Fig.S6b in Booth SI. I haven’t checked TOA outgoing SW radiation, but I would expect it to change accordingly. Quite an interesting result. Thanks for following up on it. I had tried looking at climatological comparison maps for 1961-1980 versus 1941-1960 (same dates as used in Zhang et al.) 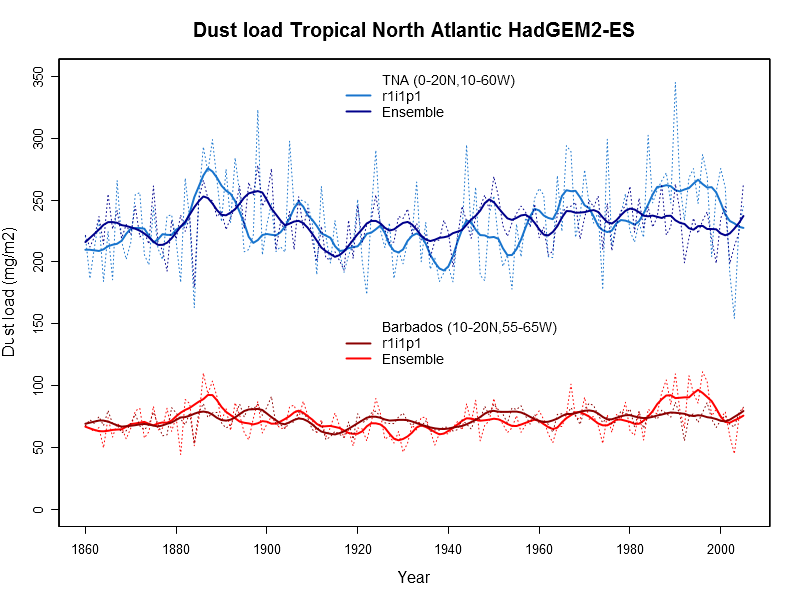 and noticed that other large dust areas (Australia, India, Somalia) were producing a strong decrease in dust load at the same time as the Tropical North Atlantic increase. It made me wonder to what extent natural variability was playing a role, and was meaning to check out the other ensemble members… I don’t have to bother now. Interesting the Krakatoa response seems to be robust, or at least there appears to be a robust increase in dust load lasting between ~1880 and 1900. Maybe it’s helpful to have a look at the coincidence of the SST-Anomaly and the salinity of the area 40-65N; 40W-0W ( the subpolar region of the northatlantic): since 1975. ( black: salinity; blue: SST) And another view at the OHC (0-700) 30N-60N; 60W-10W versus the NH-temps (HadCRUT4): https://web.archive.org/web/20130302235348/http://kaule.ath.cx:9001/uploads/ohcnatempnh.png . All data are smoothed with a 15-year loess-filter. How likely is the attribution of the north-atlantic variability to external forcings via aerosols? Recent publications such as Yuan et al. 2016 Brown et al. 2016 would also question the role of aerosols as the dominant forcing for changing North Atlantic SSTs. However, although these studies highlight the importance of atmospheric processes, particularly cloud feedback, other than aerosols, the fundamental question seems still standing. That is, what is the driver that causes AMO to fluctuate at this time scale? Clement et al. 2015 would suggest it is purely due to atmospheric noise. That is a novel idea, but it’s just too mysterious and hard to quantify or understand. Their evidence primarily comes from model simulations and from what I read, many aspects of modeled AMO is far from reality if compared with observations, which is not an argument against proposing theory based on simulations, but makes it quite suspicious. What do you think?